but DAMN do the blossoms make a tender and succulent filling for these quesadillas. 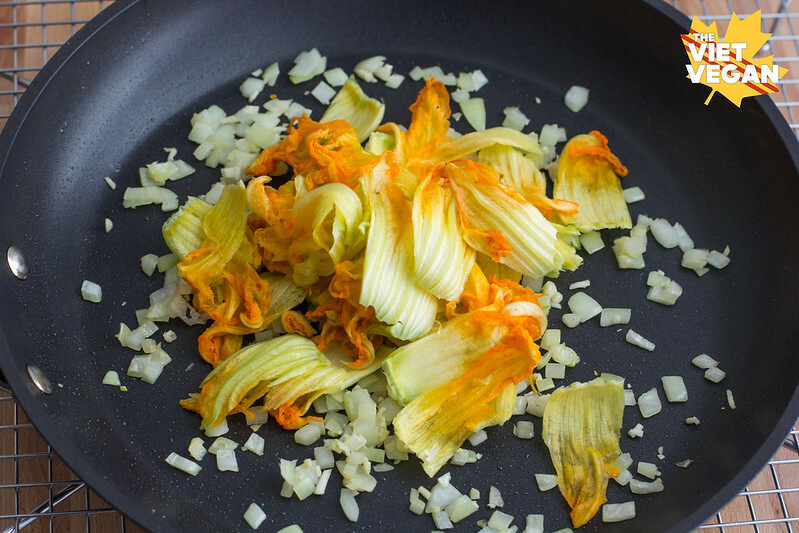 About a month ago, I developed a recipe for Produce Made Simple using zucchini blossoms, and I’ve bought them religiously every week from the farmer’s market ever since. 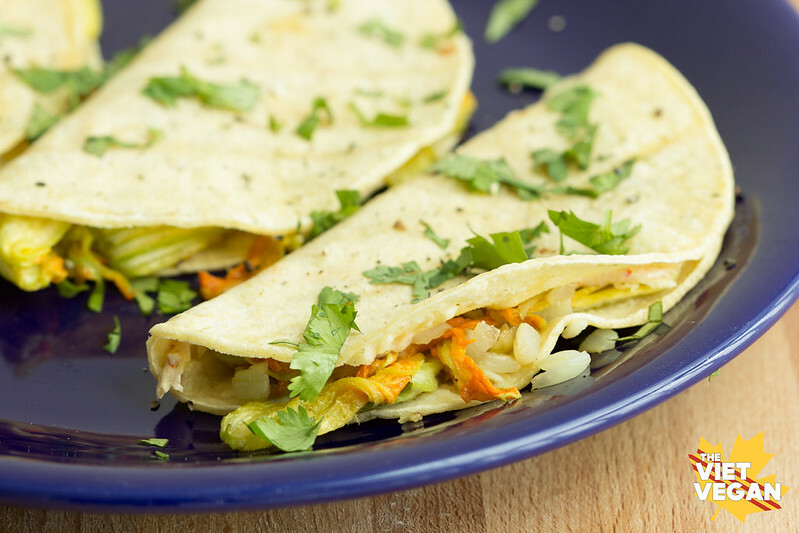 There’s something about the delicate blossoms that cook down into juicy, floral filling that takes these quesadillas to the next level. If I had more forethought, I would have added some black beans, diced tomatoes, and some avocado slices into the mix as well, but sometimes we’ve just gotta work with what we’ve got. This summer seems like the summer of both love and heartbreak. The closest people around me have either had their hearts slapped around and crushed or have hit big relationship milestones like engagements, babies, or marriage (not necessarily in that order). And despite everything that’s happened in my life, I’m still so optimistic about love. It makes me happy to see my friends and family in love, and my heart breaks for those who aren’t where they want to be in their love life. I know what it’s like to fall in and out of love, and it’s both exhilarating and terrifying at the same time. It’s so weird to be in a position to be giving people advice about matters of the heart. What do I know about love? What does anybody know about love? My hearts been crushed countless times, and I’ve broken about just as many. Does my experience with both completely opposite ends of the spectrum give people the idea that I have any inkling as to what I’m doing? Love is different for everyone. People are looking for someone that fits into their lives, and people are so vastly different, it’s hard to know when it’s a good fit. It’s so easy to think that you’ve found the right one when you’re feeling the highs. When you’re in love, you only see the good. You relish in the way that special someone makes you feel beautiful, funny, smart, and whatever other superlatives about which you feel proud or even vulnerable. You open up yourself and your feelings to someone and hope that they welcome every facet of your being. You learn their little quirks and habits, and you find yourself changing to adapt to them. All the good outshines the bad, and that’s almost always a good thing. When you start to change who you really are—that’s how you know something’s not right. It’s feeling comfortable to be who you really are. Feeling safe to say what’s on your mind. An unspoken sense of mutual respect where you can disagree, go to bed, and wake up happy to see them in the morning. It’s finding someone who complements you and brings out your light so it shines brighter. You both push each other to be happier with yourselves, to be stronger, to work harder, to be better. All your weird quirks, all your habits, all your vulnerabilities are accepted. There’s an insatiable desire to learn everything about this other person. All you want to do is make them happy. You give, you take, and you feel a natural balance. Love isn’t about changing who you are to fit the other person in your life. It’s about growing, both by yourself as well as together. Every time I enter a relationship, I think I know everything there is to know about me, and consequently how I view love. It’s not until someone comes into your life and shakes things up do you notice new things about your strengths and your shortcomings. It just reminds me that we are susceptible to change. Things we thought were fixed points in ourselves can shift and our perspectives are malleable. Does this person allow me to be who I want to be? 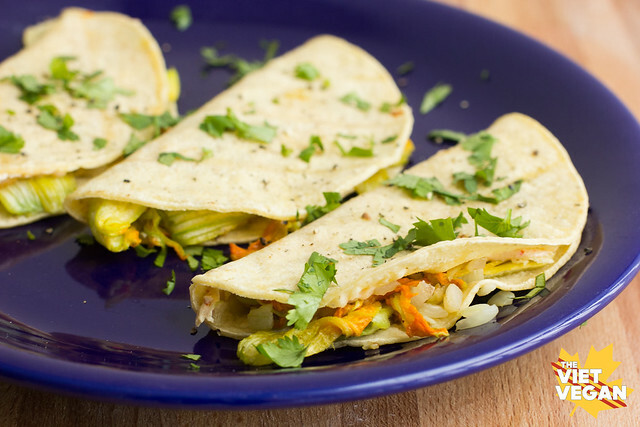 In pan over medium heat, warm the tortillas until the edges start to curl just a bit. Flip over and add the cheese to one side. Fill with the zucchini blossom mixture and fold over to cook through. Flip once the bottom starts to brown a bit, and let the other side cook. 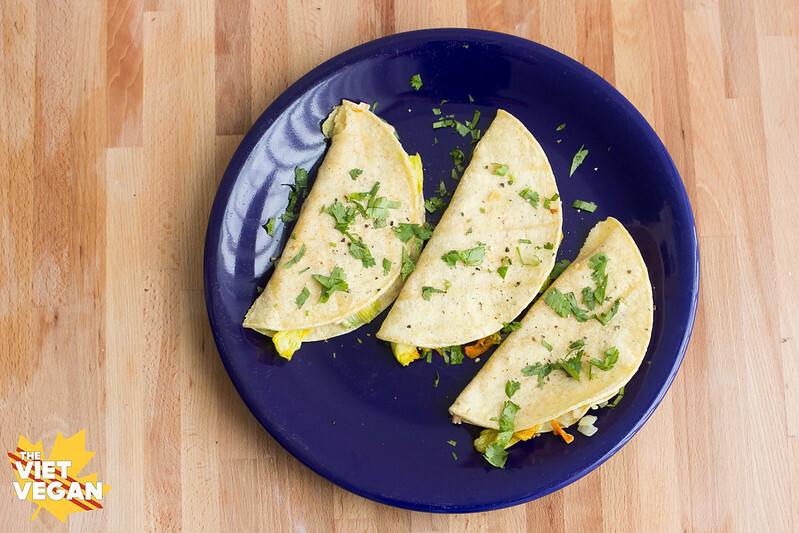 Once the cheese is melted, remove from pan and serve with a sprinkling of cilantro, salsa, and vegan sour cream. ^_^ thanks for stopping by!